As struggles go, being an artist isn't that much of one. 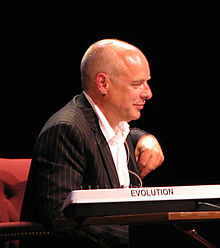 Brian Peter George St. John le Baptiste de la Salle Eno (born 15 May 1948), commonly referred to simply as Eno, is an English musician, composer, record producer, singer and visual artist, known as one of the principal innovators of ambient music. Rationality is what we do to organize the world, to make it possible to predict. Art is the rehearsal for the inapplicability and failure of that process. If you don’t call it art, you’re likely to get a better result. Ideas worth questioning: "Being an artist is a job for life." The reason conservatives cohere and radicals fight: everyone agrees about fears, no one about visions. My friend Peter Schmidt used to talk about ‘not doing the things that nobody had ever thought of not doing’, which is an inverse process – where you leave out an assumption that everybody has always made and see what happens (e.g. music has to be made of intentionally produced sounds was the assumption that Cage left out). In that version of this process, you discover a value in the absence of something ­– in fact you discover that the absence of something is the revelation of something else (Buñuel, the film-maker, said, "Every object conceals another" – a message that I often relay in the studio when overdubbing starts). Ambient Music must be able to accommodate many levels of listening attention without enforcing one in particular; it must be as ignorable [sic] as it is interesting.